We are hard at work creating the next Galactic Civilizations III beta and we will have a lot of fun things for you to play with. But I wanted to talk about one of my favorites, Custom Races. First off there are 2 ways to create custom races. First you can add them as a mod (but more about that in a future post). For this post I wanted to talk about everything you can do in the in game tool to create a wide variety of unique, interesting and weird species to populate your universes. First off you will notice that we have a new choose civilization window. The last one did a really good job of allowing you to select 1 of the 8 base factions, but we wanted space for more, so that players would feel free to create their own and wouldn’t have to scroll to get to them. Don’t mind the brown and gold UI colors, I was playing as my custom faction, the Marauders, and those are their UI colors. You may notice that the Iconian and the Thalan are enabled now, and I’ve created 5 new customer factions, the Cult of Cinder, the Jade Council, the Marauders, the Quantum Core and the Hive. 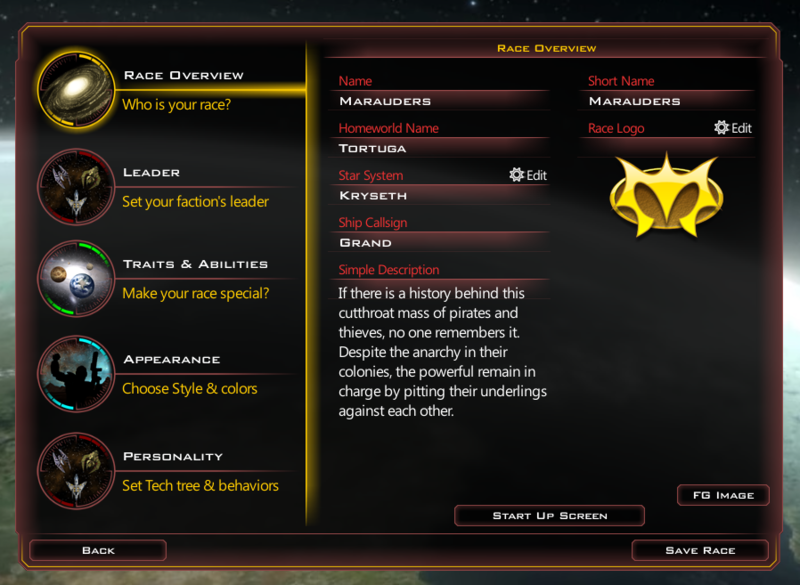 Creating a new faction is pretty easy, click create custom race and you have a lot of options to choose from. The above is where I set the name, picked the logo and filled in some detail. You can also see a floating “FG Image” button that appears to have escaped from the window it belongs on. This is my favorite window. Our artists are really amazing and I love this model in particular. Creating the way he looks involves selecting a character image and a background image. These can be animated binks or still images and you can mix and match them if you want to use this guy but put in science lab, the Drengin war room or an organic chamber that looks like he’s flying around inside someone spleen. This is where the magic happens. 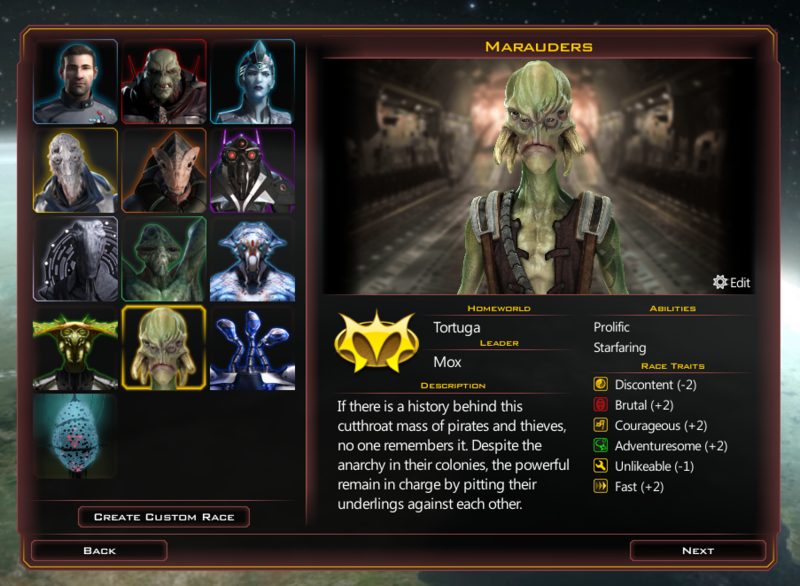 I want my Maurders to be restless pirates so they get an approval penalty (Content -2), but they are very effective at both invading and defending planets (Brutal +2 and Courageous +2) as well as having a high range (Adventuresome +2) and speed (Fast +2) so they can get into trouble. I also made all the other factions dislike them a bit (Likeable -1). They aren’t as bad as being a neighbor with the Yor, but they aren’t much better. As for abilities I gave them Starfaring so they are immune to Nebula effects and they get their first Starbase module for free and Prolific so they get double the population provided by colony ships when they found a colony (they must throw a heck of a party when they land). Personality may not mean tons when you are playing them, but it means everything when the AI is playing them. 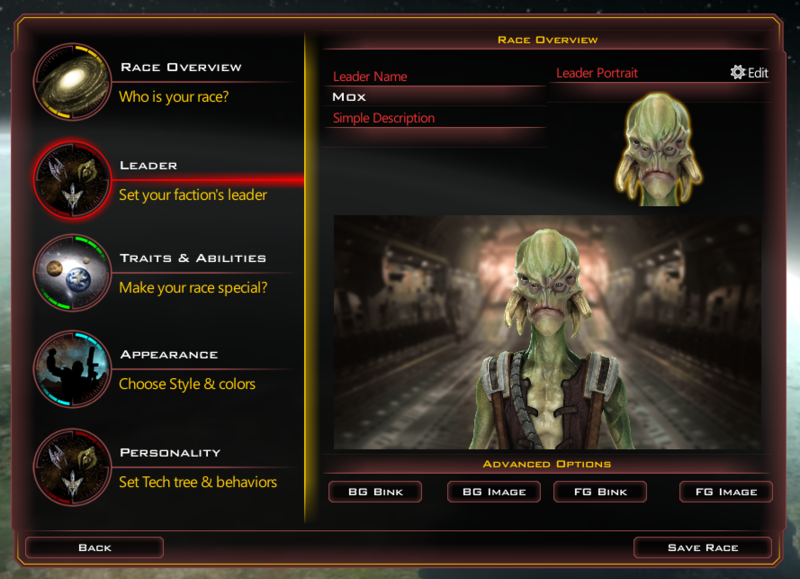 Character traits is used by the AI to evaluate a wide range of decisions, from which way to vote on a UP proposal to when and if it should trade or declare war. Priorities are used to make decisions about which Tech to research or Improvement to build. This way even if two races have similar stats they can be played by the AI very differently. Which brings us to one of the best reasons to create custom factions. Even if you don’t play as them it’s a great way to fill your universe with opponents to defeat and to make sure every game of Galactic Civilizations III is a new experience. 1. In Beta 5 how many AI factions can be enabled for a given game...in your screenshot you seem to have 9, but is that the limit? 2. Will custom factions be available to fill out a MP game? 3. Oh and one more...will we ba able to import pictures for our custom faction leaders? A bit of fluff, I realize. 1. I've played with 100 factions in one game. 2. Yes, but I haven't tested that personally. I'm going to have to try that! 3. Yes. We have a bug right now where the images aren't being picked up out of the mod directories. It works fine if you put your own images in the game directories, but we will get it working with the mod directories before we put out the beta (we dont want people messing with files in the game directories). I've played games against the Weeping Angels, Kree Empire, Dalek, Arilou, Spathi, Cybermen and Skrulls. It's a lot of fun. I don't think my excitement can be contained.
! I am sooo waiting for the Thalan to come into play. They were my fav in GC2, I hope they are in the next beta release. I was happy enough to get the Yor(my 2nd fav naturally). Mostly due to the unique tech trees but still awesome nonetheless. Keep up the good work! Will we be able to use bink 1 or does it only work with bink 2? it's more of a curiosity than concern, how is the race's homework pq determined. I'm laying in bed on my phone, but iirc some races have a 10 & 4-5 while the yor have a +15(?). The screenshots have homeworld name and no indications that I could see about that. They stated in the stream that you would be able to customize the homeworld, it's just not implemented yet. That sound freking awesome! I want to make a custom race NOW. 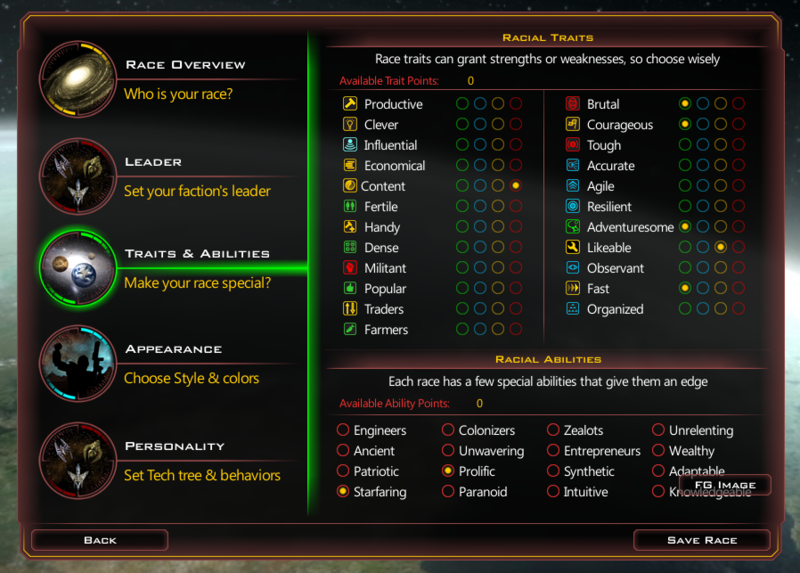 As we can choose abilities, traits, homeworlds etc. Is the Tech Tree affectable ? Because every CIV has its own Tech Tree so far. I would guess one could go into the xml and make a custom one then use it for their civ. someone else mentioned it with the xml's being a poor solution for such a basic thing, but "The Quantum Core" doesn't sound very syntheticrace==false making me suspect that a screenshot for that pulldown just got missed. If it's actually not there right now, I hope that by gold/release a dropdown for use $faction's techtree becomes available. 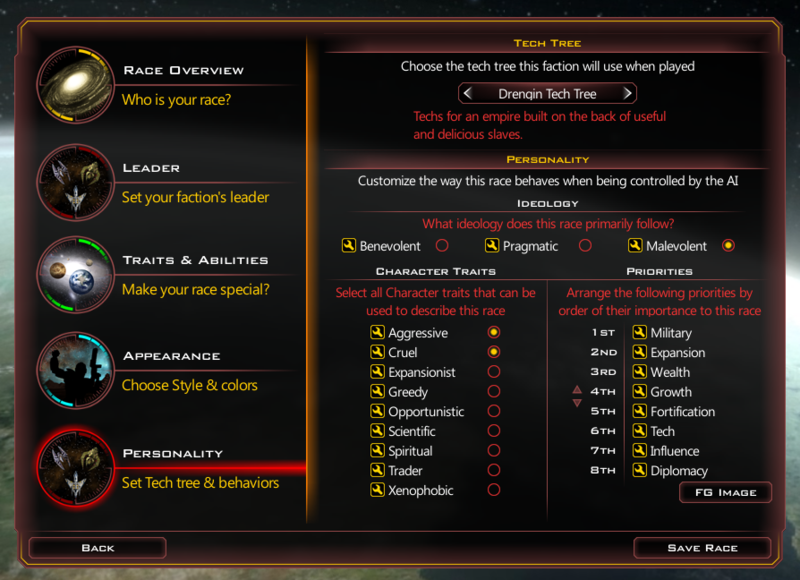 Hopefully that dropdown includes any custom tech trees for new races modded in. Techs will probably always a modding thing. We have an excel editor that writes out all the XML for us that we are happy to share. One of the nice parts of this is that if someone makes a few cool tech trees they can share them and every can place them as mods and then allow their custom factions to use them. But make no mistake, there is a huge amount of things that can be modified in XML, and if you really want to make something unique and special that's where you will want to go (and then share what you have created so other people can play with it too). No in game editor in the world is going to give you the power of being able to go edit the files directly. You guys are right that XML isn't inherently balanced, but forcing balance keeps you from doing really interesting things. You all are tops. Awesome work Derek! Can we just select say 15 minors as custom factions and start a game? What I mean is can I just select a game, pick all majors add 12 or 20 minors or do I need to create each as a custom faction? Will the "game" set this up with 'random' factions/minors? Yes there will already be minor factions available and ready, that you don't have to create, when you go to start a game. It's entirely possible you will run into a race of crazy squirrel creatures out in the universe without having to do anything. 1. Are created by you. 2. Can be played by you (you can't play as a minor faction). 3. Are major players (meaning they are required for diplomatic victory, can build colony ships, etc). 4. Are better than minor faction (they will generally have better abilities and traits than a minor player does). I believe what Larsenex is asking is if we can select a minor faction as a major. Thank you for your hard work. All of you in that office are very much appreciated! Rhonin, thanks. Derek answered the question. I just wanted to know if I wanted 'extra' factions AND minors, that I would not have to create them. I am happy to do so but wanted to know if I wanted to just set up a game with 10 factions and 15 minors and set other parameters and go if that was possible. I believe Derek answered it. So these are 'custom' factions which is super awesome! Can we create custom minors or have many many minors? probably always a modding thing. We have an excel editor that writes out all the XML for us that we are happy to share. One of the nice parts of this is that if someone makes a few cool tech trees they can share them and every can place them as mods and then allow their custom factions to use them. very cool, I would love to see that excel file. With that said, I agree that what can be done with the xml's is awesome (even compared to GalCivII's xml's). I see what you are saying. No, there won't be an ingame tool to create minor factions. It wouldn't be a big deal to add that to the custom faction options since being a minor faction is only the change of one field in XML, but it may be kind of messy in the UI (since we don't display minors on these screens). All fixable problems if we decide to add it down the road. But as it is currently, if you want to create a ton of new minor factions, besides the ones provided with the game, you should add them as a mod (ie: dump the xml in your mod directory). Very nice! Creating new factions with custom AI settings without modding is great. So we can import pictures for our faction leaders? What about importing the background image? I think now I can totally create my space Roman Empire! What are the Race logo and picture requierments. So glad I bought into this beta.. now for an emblem for those of us that didn't hear about the founder thing.. maybe it can be bronze? I yield the superior metal type to the founders. I am not a fan of mods in general (I'm more of a purist), however . 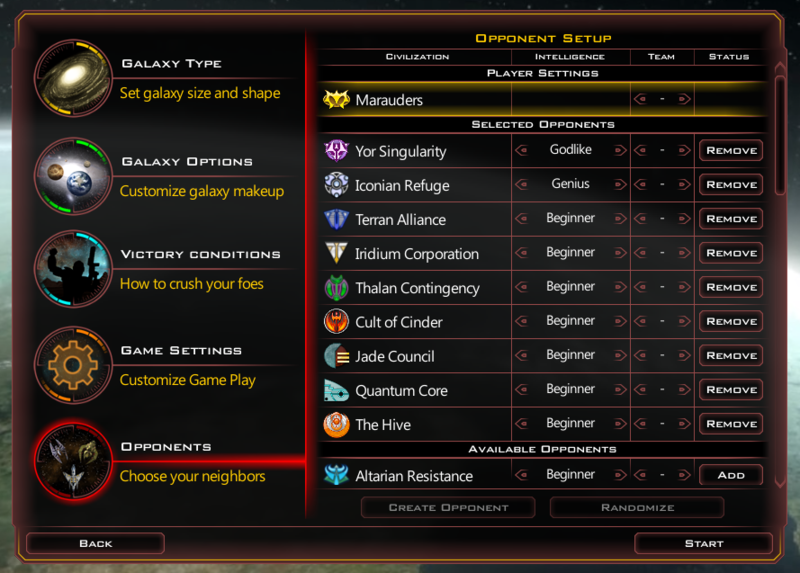 . . holy crap do the possibilities seem endless for modding GalCiv3! I can't wait to see all of my favorite sci-fi IPs sneak their way into this game! It would be cool to use custom portraits in multiplayer games.